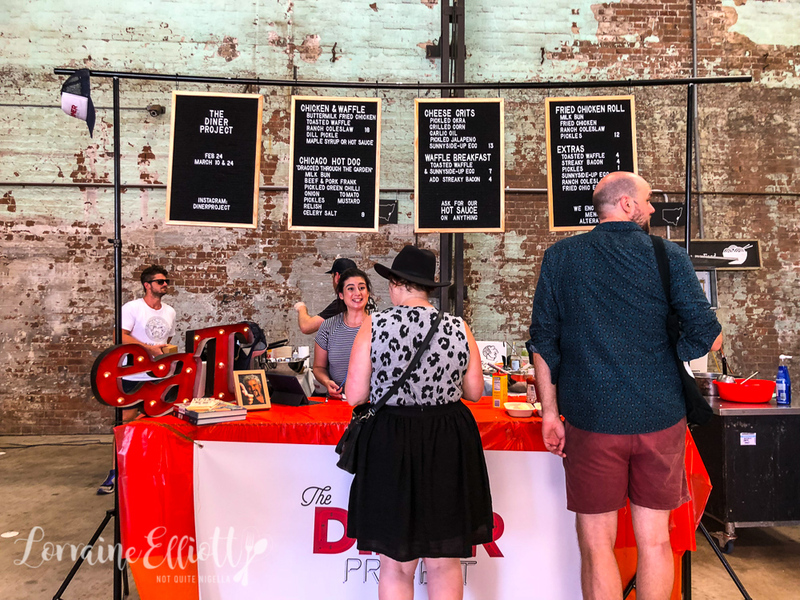 Food writer Tristan Lutze's 2015 trip across America was the impetus behind The Diner Project, a fortnightly pop up at the Carriageworks market in Eveleigh. Here you'll find the spoils of his trip with diner dishes such as a "Dragged Through the Garden" Chicago style hot dog or his signature dish: Chicken & Waffles. Menu alterations are encouraged, diner style and he takes no shortcuts or substitutes with this passion project. It was an unexpected and painful twist in Tristan's personal life that was the catalyst for the Route 66 trip. He was undergoing an unexpected divorce when he decided he needed to leave Sydney to clear his head. 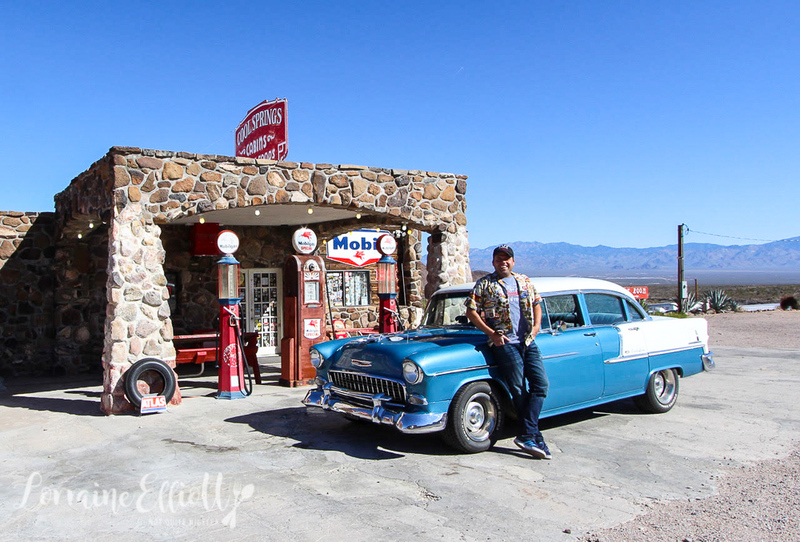 "I figured a month-long dull drive was exactly what I needed to clear my head, so I flew to Chicago (where Route 66 starts), rented a baby blue 1955 Chevy Bel Air and started driving Route 66." He explains, "Route 66 is 2,500 miles (4,000km) of rattling down what are now largely un-maintained B-roads running alongside the epic multi-lane interstates. Most people tend to not use what’s left of the ‘Mother Road’ unless they’re trying to get to some small out-of-the-way town or, like me, taking the longest possible journey between two places." It took him only 13 minutes into his journey and 1 hour after breakfast before he pulled over for the first of many stops stopping for a Chicago hot dog. "Half an hour later, I stopped at a generations-old diner called ‘Dhel Rhea’s Chicken Basket and Cocktail Lounge’, where I was talked into having the all-you-can-eat fried chicken lunch at 11am. That first hour set the mood for the trip. I drove for six weeks, eight hours a day, and I never once got anywhere close to bored. There was another new town every half an hour with some bustling diner or other vintage attraction (the Museum of Barbed Wire being one notable example) forcing me to pull over," says Tristan. For the next 6 weeks, "I’d wake up in a vintage motel, my car parked right outside the door, and set off each morning at 6am, stopping at a diner for breakfast. I got addicted to bad percolator coffee and, as often as possible, tried to get access to the kitchen to garner a secret recipe or two." With this persistence came the ultimate reward. "I learned over a dozen different ways of making fried chicken. Figured out the best way to fillet and season catfish. Cracked the secret codes of the humble waffle. Experienced the difference between store-bought and homemade ranch dressing. Overdosed on chicken-fried steak. And, in one painful experience, found out what a ‘horseshoe’ is (the local specialty in Springfield, Illinois: two slices of Texas toast, each with a burger patty on it, covered in a mountain of fries, drowned in cheese sauce. The worst, most amazing thing I’ve ever eaten)," he says. 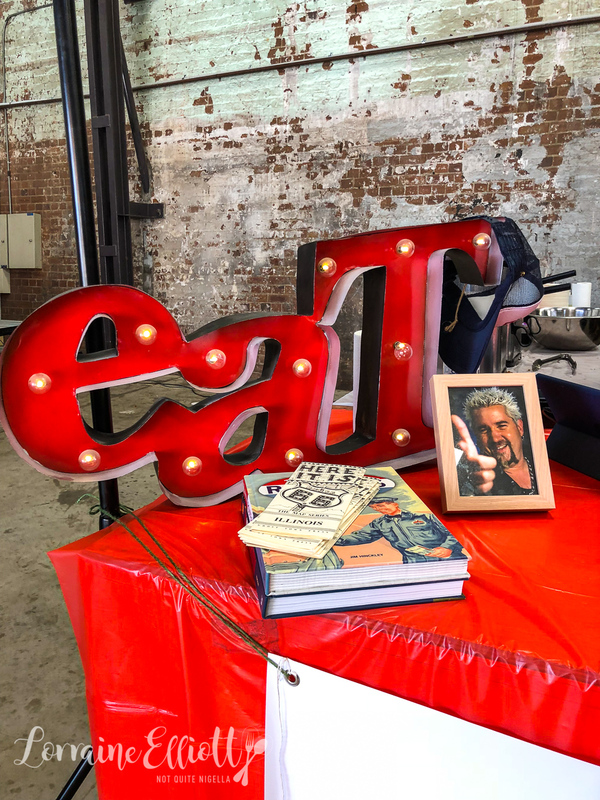 The Diner Project has four pop ups ending on March the 24th. 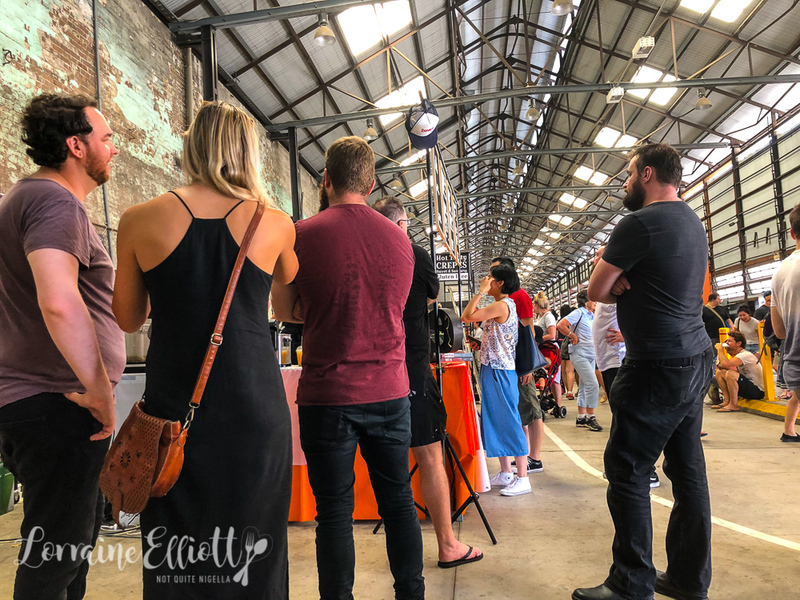 We've just arrived at Carriageworks markets in Eveleigh with Mochi in tow and found the Diner Project at the Westernmost end of the building. I'm very excited to try diner food again having had my own American road trip in 2013 that focused on road food at diners. Diners are wonderfully unpretentious and hospitable places where people are always friendly, ready with a quip, quote or compliment and for many travellers, like a home away from home. 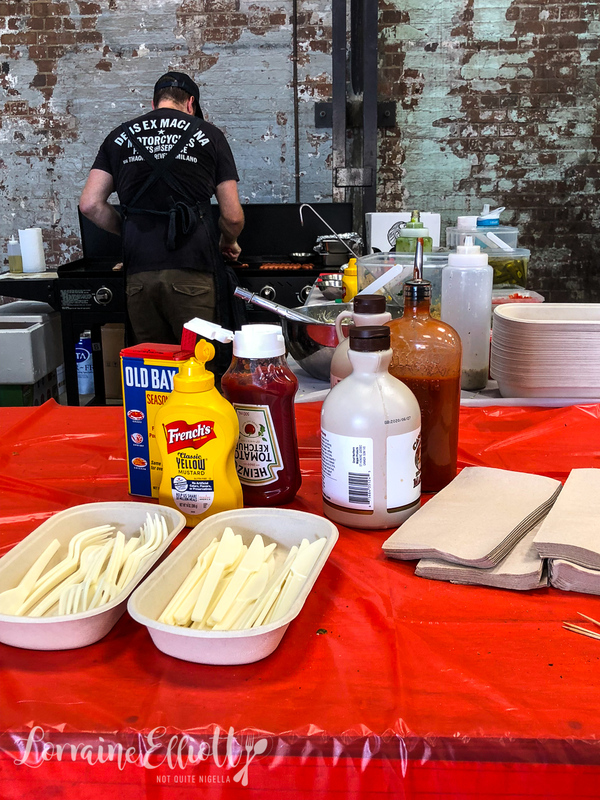 The Diner Project's sign say "Menu alterations are welcome" and allows people to help themselves to as many condiments like unlimited house-made hot sauce and maple syrup (the REAL stuff). 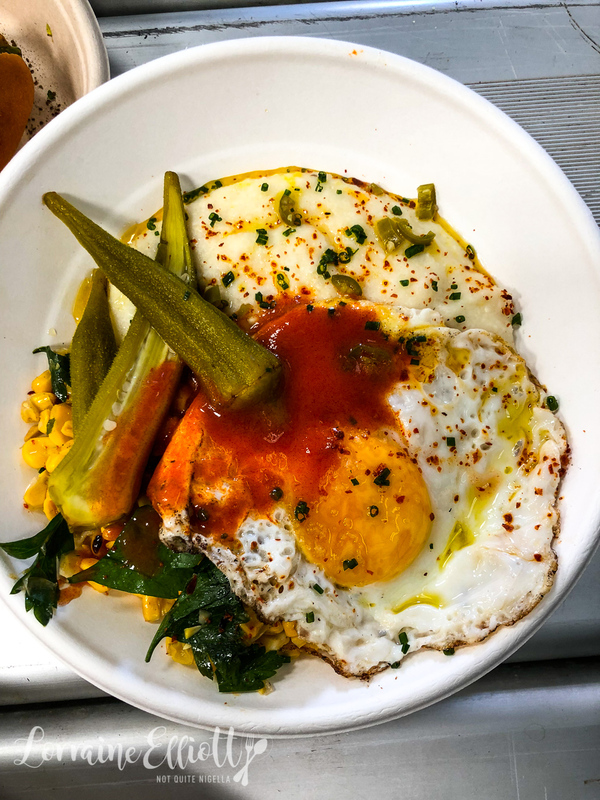 "Diners, as a general rule, encourage menu alteration, which is almost a completely foreign concept here (most menus outright forbid it)," says Tristan. It's a popular stand and I'm not the only one that orders one of everything from the menu. Chicago style hot dogs are in a league of their own. "Buy a hot dog from a street vendor in New York and you’ll get a bun, frank and an optional drizzle of mustard. Buy one in Chicago and it’ll come covered in relish, mustard, white onion, pickles, pickled guindilla chilli, fresh tomato and a dusting of celery salt (all of which they gloriously call ‘dragged through the garden’)," explains Tristan. Mr NQN is smitten with the Chicago style hot dog. 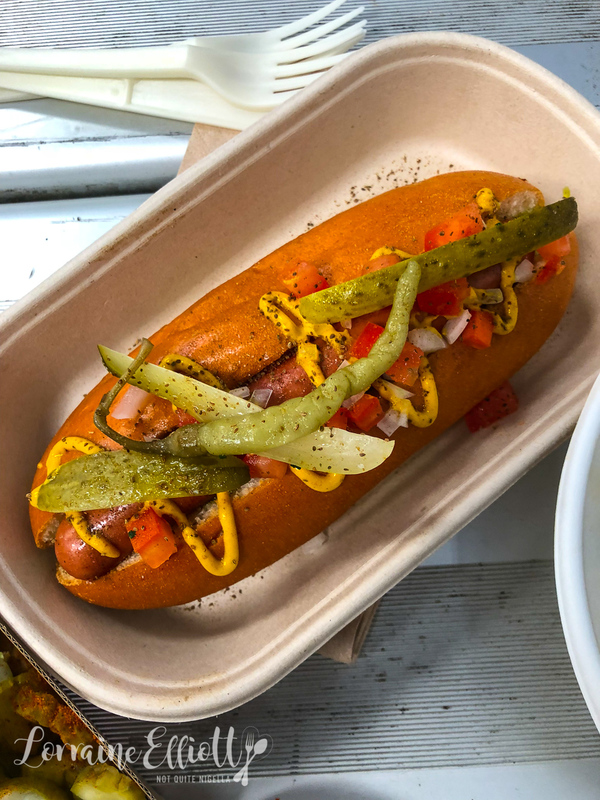 It's got a bit of everything starting with a milk bun, a beef and pork frankfurter sausage, pickled green chilli, onion, pickles, tomato, mustard, relish and celery salt. And I don't know how you'd ever go back to a plain hot dog after this. 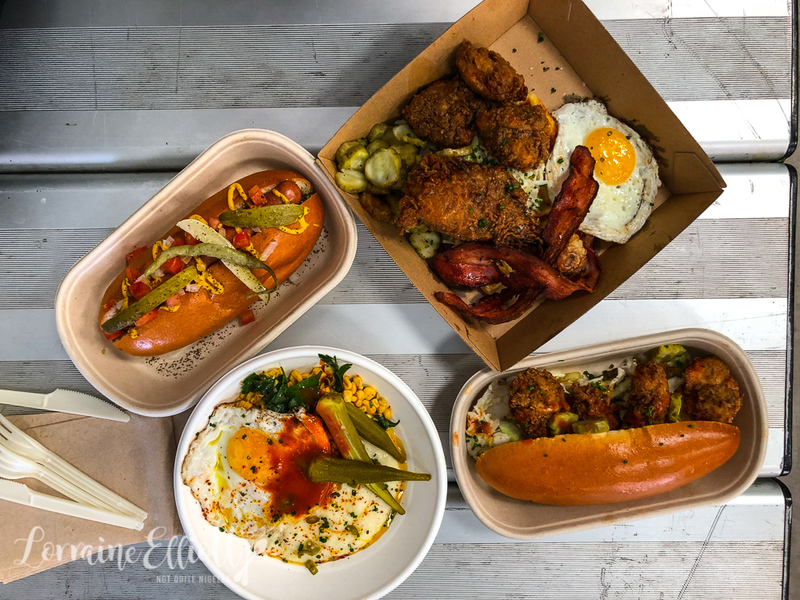 But the hot dog proved to be one of the most difficult to replicate for Tristan, "My desperate need to do everything authentically nearly undid me here, as it took me literally months to find the right smoked beef frankfurter and milk bun. But it’s probably my favourite thing on my menu now- biting into it transports me instantly right back to Chicago." His signature item however is the fried chicken. 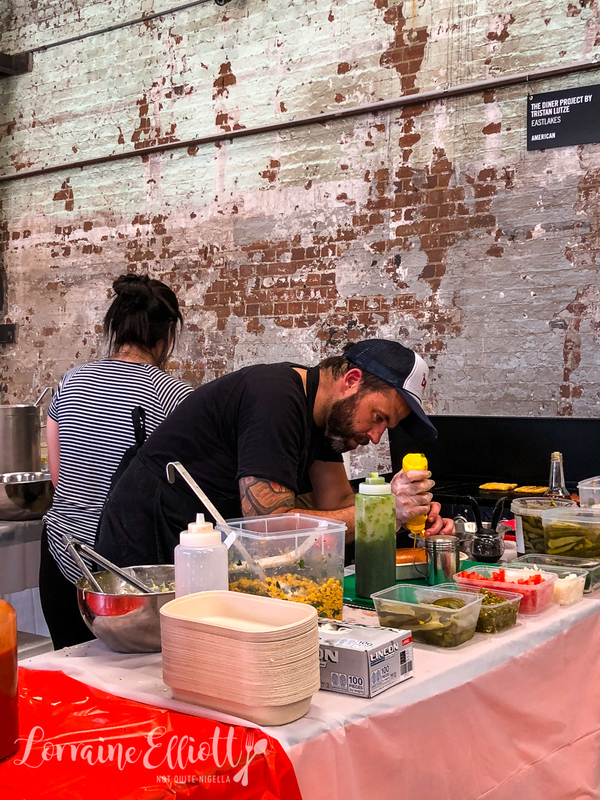 But, "I would never claim to be cooking Sydney’s best fried chicken (wars have been started over less), but I can guarantee it’s the most authentic to Route 66," says Tristan of his delectable fried chicken-the thing I have to be physically pulled away from. There is a drumstick as well as boneless pieces on our breakfast tray. "People talk about ‘fried chicken’ as though there’s a single empirical style, when there are dozens and dozens of variations. Different brines, different buttermilk mixes, different breading mixes, different types of oil, different oil temperatures. Some are single-breaded, others triple. Some use bread crumbs, others flour," explains Tristan. 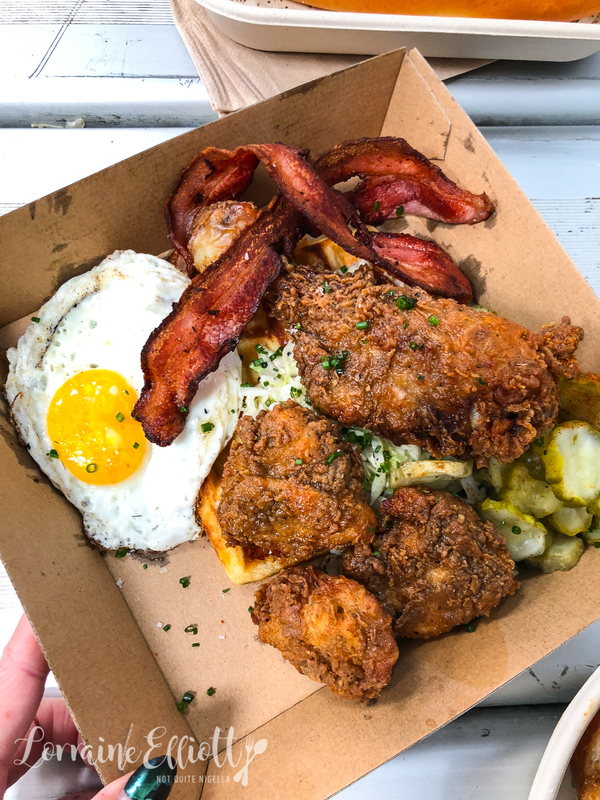 The fried chicken is a labour of love and it shows with every bite. He brines it in a mix of Pepe Saya buttermilk, egg, salt and the same spices from the breading - this allows the flavours to permeate the chicken. The breading is made of three different flours and five spices including a generous amount of black pepper to make it work with the maple syrup in the same way that honey and black pepper flavours work with Chinese food. The chicken is precisely cooked at three different temperatures. The waffle itself is designed by Tristan to be quick to cook at a food stall while staying crisp on the outside and soft on the inside. Which brings him to the subject of the egg. "While we Australians tend to prefer our eggs poached, they’re far less common in the middle of America. Good thing too because, in my opinion, the sunny-side up egg is the perfect egg. Fried on one side only until the edges are crispy, the white completely set and the yolk still a gloriously gooey mess, it’s the perfect thing to have oozing into your waffle holes," he says. 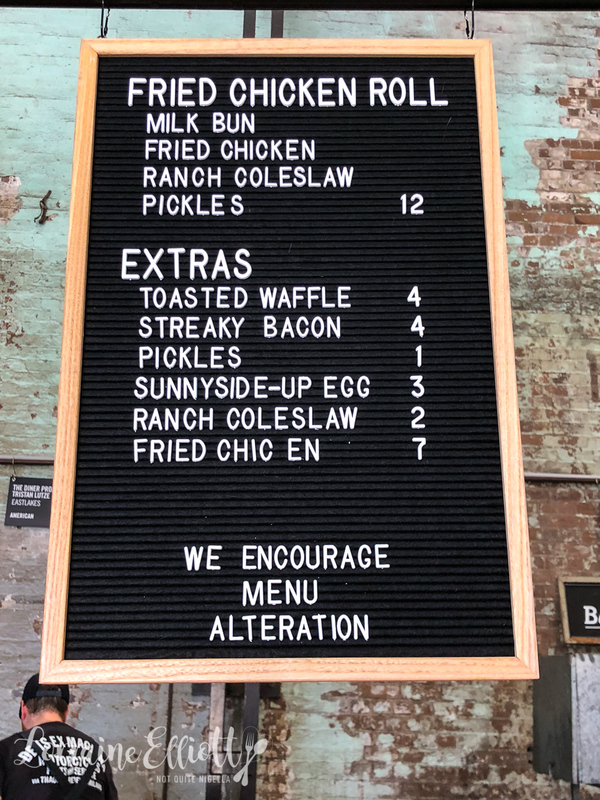 The fried chicken roll is for those that want to try the fried chicken to-go in a portable bun. 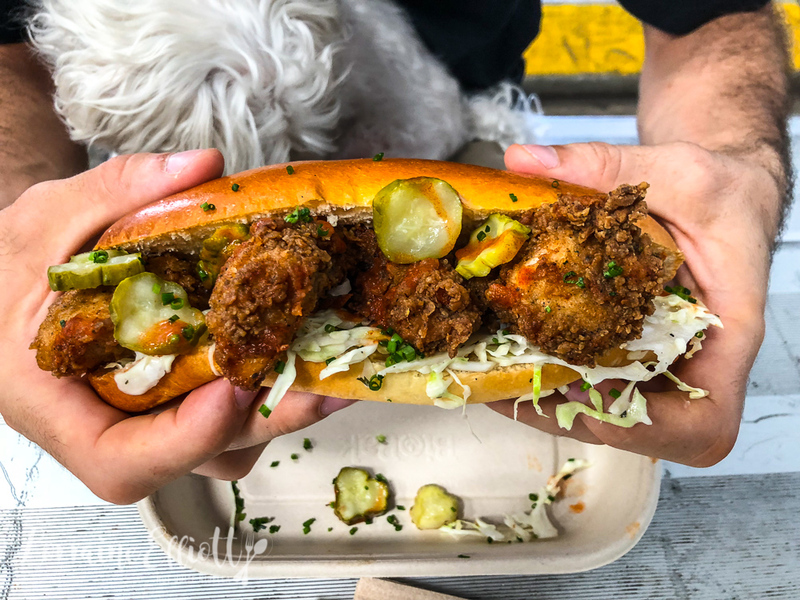 To the boneless fried chicken pieces he adds dill and garlic pickles, ranch coleslaw and on a freshly baked milk bun. It's good, but for me nothing beats sitting down to a plate of chicken and waffles because that way you can get the maple syrup too which is perhaps not practical on a bun. Grits are traditionally a Southern food but Tristan would often see them appearing in bigger Route 66 towns like Santa Fe, Oklahoma City, St Louis and Tulsa. He says, "I cook them like I would polenta - in milk, softened with butter and held together with cheese (Jack cheese, to keep things authentic). I serve it with a drizzle of confit garlic olive oil (made by cooking dozens of cloves of garlic in olive oil at 79°C for three hours), sprinkled with Aleppo pepper and chives, topped with a grilled corn salsa, pickled jalapeños, pickled okra (preserved in a turmeric-heavy brine that helps counter the natural sliminess of the okra) and a sunny-side up egg". It's pure comfort food especially with the sunny side egg. I also add some of the hot sauce just to add a pep of flavour but it doesn't really need it. The process of making the hot sauce which is made over a period of four months with fermented jalapeños and homemade white wine vinegar. See what I mean? No shortcuts here! So tell me Dear Reader, how do you feel about the egg? Fried, poached or scrambled? Have you ever travelled along Route 66? 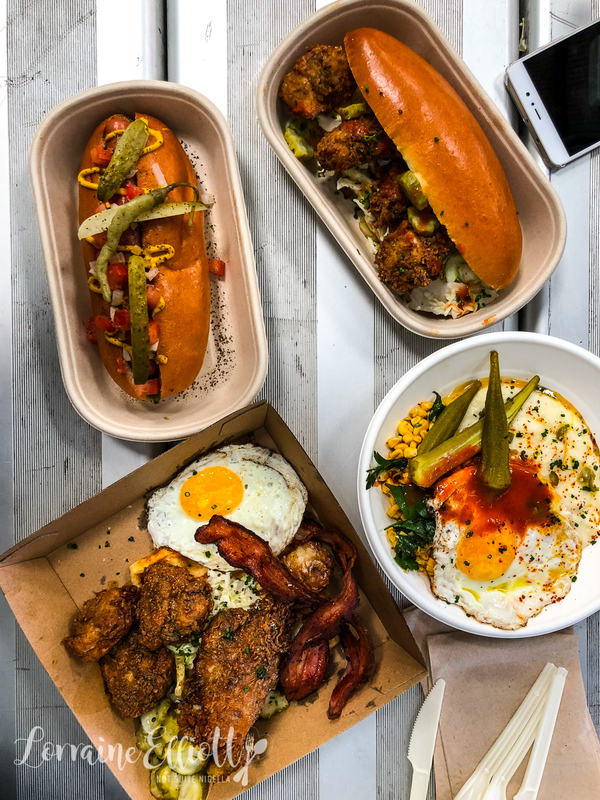 Have you ever tried a Chicago style hot dog an which dish appealed to you the most?